Tubes are used to serve many functions: containment, support, transportation, protection etc. Tube Cutting – STAM, Inc.
Tube cutting is used to aid the use of tubes in the agricultural, construction, aerospace, automotive, electrical and medical industries for applications that range from prototypes to large production runs or basic engines and flow systems. A variety of processes, including both hot and cold working methods can be employed in the process of cutting tubes and piping. Tubes can range greatly in durability, density and hardness, depending on their intended application. In accordance with the hardness of the tube material, its thickness and diameter, and the specifications of the end of the tube, a range of tube cutters can be used. Handheld cutters are often used to trim pipes made from plastics or from softer metals such as aluminum, copper and brass. Other tools used for cutting are circular saws, horizontal band saws, lathes, lasers and electronically powered blades. Heavy-duty cutting machines are required for larger tubing made of stronger metals such as iron or stainless steel, and in most cases, these cutters will be bench-mounted or attached to a larger piece of machinery. 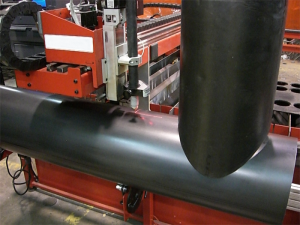 The cutting machine needs to be durable and easy to operate as part of a tube fabricating system. Most tube cutting is done by the blade making a full rotation around the circumference of the tube and slicing through the wall. Internal cutters are typically abrasive blades or contoured blades which cut a tube from the inside out. For applications requiring a tube to be cut without space for a rotational cutter, a cutter with a hinged handle and blade can be used. As tube cutting can result in surface imperfections along the edge of the cut, extra finishing process may be required such as sanding or polishing to finish the process of cutting. Automatic deburring machines are available to remove burrs in a method known as shear tube cutting. Cutting can be done at many different stages depending on the application and the configurations of the tubing. Tube bending and pipe bending can be done before tube cutting is done to trim the tube to the exact lengths. Computerized machinery can also be used to ensure the precision of the operation and to direct the electronic system in control of the blade. This will typically result in a better finish than manual cutting although it is not always feasible. Tube Cutting Tube cutting is a tube fabricating process in which tubes are cut to specific lengths according to intended application and use, or for transport and storage purposes.